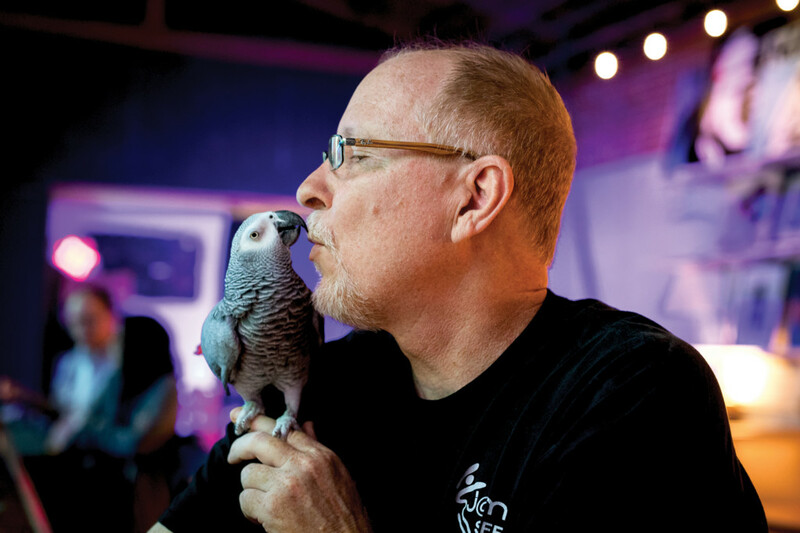 Russ Pangratz and his parrot have become regulars and local celebrities at the popular music venue. Russ Pangratz asked for a better kiss and puckered up again, and Princess planted a bigger chirp, this one with smack, on her owner’s lips. That’s Princess, an African grey parrot and the new mascot of Pangratz’s The Junction At Monroe music venue on South Monroe Street. Princess likes mwahs, margaritas and, yes, music. But she doesn’t like dogs, daredevils and digits. She’s happy to walk around on your hand or forearm. But get too brave and careless with your fingers, and you’ll forget the band that just played. You’ll want a Band-Aid. Princess is the first to greet customers at J@M, where she roosts in a spacious cage near the entrance of the former warehouse. A handwritten note makes no beaks about it: “I bite! Please keep hands & faces away. Thanks” Yet customers think she rocks. On a recent night, they cooed at her, talked nice to her — “Pretty girl!” — and parroted the magic question. “What does she say?” a woman asked. “She says all kinds of stuff,” said Pangratz, bird in hand. Examples from Pangratz: “Do you want a margarita?” and “Be quiet.” To dogs, she commands: “Outside, outside, c’mon — out!” “And ‘Bad boy! Bad boy!’ ” her owner added. She also meows like a cat and barks like a dog and recently started sneezing like Donald Duck, a cartoon cousin of sorts. Pangratz said he got Princess shortly after she hatched, from the owners of a local animal DNA testing lab for which he was doing web development. “And she’s been part of the family ever since,” he said. He feeds her grain-based pellets that include vitamins and minerals. The bird also dines, Pangratz said, on grapes, cheese, spaghetti, mashed potatoes and even, in an avian act of cannibalism, chicken wings. In early 2018, Pangratz decided to make his business his home, and he brought Princess with him. He keeps her mostly in her cage but occasionally carries her around as he mingles with customers. Outside of business hours, he said, she often falls asleep on his chest. But others can’t. She might object and peck. “I can do anything with her that no one else can,” he said. A visitor asked to take Princess for a walk around the music venue. Pangratz, bird on his hand, instructed the visitor to hold out an arm, and Princess made the transfer without hesitation — settling calmly to the beat of a Stevie Wonder cover band. “What I’m amazed about with this bird is how adapted it is to the amount of people who come through here,” said Mike Fox, a friend who was helping out a short-handed Pangratz at the cash register. Two rooms over, the band was finishing up “Ma Cherie Amour,” drawing applause from the crowd. On her way into her cage, Princess joined in with a whistle. The African grey parrot is known for its mimicking ability, high intelligence and high-maintenance personality. The species, native to equatorial western and central Africa, generally lives 60-65 years in captivity and can cost up to $2,500 unweaned, said Ray Qaiser, a Tallahassee bird breeder who said he doesn’t currently breed the species. You can find them offered for much more and much less. He said they pick up words quickly. He said he built a commode for an African grey he once owned. The bird didn’t disappoint, he said, doing its business right on target. The species was featured in a 2008 book, “Alex & Me,” about the bond that scientist Irene Pepperberg said she formed with her African grey parrot during research of the bird’s cognitive and communicative abilities. A bird “with a brain the size of a shelled walnut could do the kinds of things that young children do,” she wrote in her book.